Violence and murders, protests and incitement have surged again in Israel. When Israel put safeguards in place on the Temple Mount after the brutal murder of two Israeli policemen, hostility and fierce aggression broke out in the West Bank and East Jerusalem. Stabbings and car-ramming attacks against Israelis are being coordinated by Hamas in an effort to escalate the violence further. This past Friday night, a horrible terror attack was carried out at the home of the Salomon family in Halamish. As they sat at their Shabbat table, a terrorist broke in, brutally murdering three members of the family and badly wounding a fourth as they were celebrating the birth of a new grandson. Five young children lost their beloved father, grandfather, and aunt, hearing their screams through the door as their mother hid them, saving their lives. 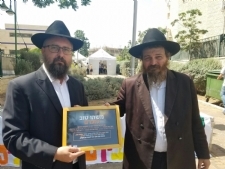 Rabbi Menachem Kutner, Director of Chabad’s Terror Victims Project (CTVP), and other Chabad representatives, visited the family to offer comfort and solace and to assist them in any way possible. Rabbi Kutner told the family that a Chabad Mitzvah Campaign has been started, asking people around the world to take on an extra mitzvah in memory of the family members who were murdered. 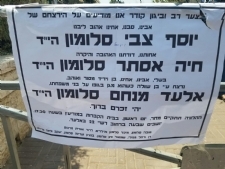 The grandmother, badly wounded herself, and the widow of the grandfather who was killed, told Rabbi Kutner how much her family appreciates this. Knowing that people everywhere are thinking of them and adding mitzvahs in memory of her husband, son, and daughter is a great source of comfort. Please pray for her continued recovery, Tova bas Chaya Esther. Many of the family members at the shiva house spoke of their strong connection to Chabad, both in Israel and in other countries, and offered heartfelt thanks for Rabbi Kutner and the Chabad representatives who came to comfort them. As the violence in Israel continues to escalate, please join with Chabad’s Terror Victims Project to ensure that all victims and their families - past and present - have the aid and assistance they desperately need. Please help us ensure that financial, emotional and spiritual support are there for these families immediately – and for as long as they need us. Your partnership with CTVP against this reign of violence is urgently needed. And please pray that peace will come to Israel and the world and that there will no longer be a need for organizations such as ours. Thank you.